Hello, 2016! Do you make New Year’s resolutions? Like a lot of people, mine usually have to do with getting healthier, physically and mentally, because the new year is the perfect time to turn over a new leaf. A new, greener leaf! It’s a great time to clean up our diets (I know I’m ready to get back to healthy eating again after all those holiday treats) and clean up our homes and cleaning routines too. If you’re not sure where to start, I can help! I’ve teamed up with local BC-based Foster Naturals to take a look at their new line of natural and eco-friendly home care products. Foster Naturals’ mission is to “foster a better way of living through the use of natural, sustainable, organic ingredients, and products that have been sourced through fair trade, biodynamic, permaculture and organic farming practices.” All products are biodegradable, vegan-friendly (Leaping Bunny and PETA certified), hypoallergenic, and waterway and septic system safe, as well as Fair Trade and sustainably made right here in British Columbia, Canada. Foster Naturals uses only natural extracts, essences and oils of fruits, vegetables, herbs, nuts, seeds, and plants. 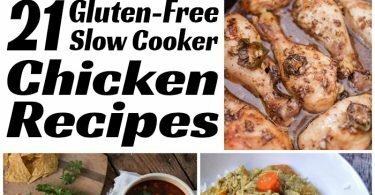 I can pronounce every ingredient, and each product lists all the ingredients on the bottle and on their website for anyone to see. No greenwashing here! Foster Naturals has a full line of non-toxic home care products made with the cleaning power of soapwort herb and eco-friendly, vegetarian polyglucose. Because their products are so pure and made with only non-toxic ingredients, they’re safe for the whole family and for the environment. No toxins, ammonia, GMOs, sulfates, parabens, phosphates, or other synthetic ingredients. But they still have to work, right? All Foster Naturals products are rigorously lab tested (never on animals) both for effectiveness and for safety, including microbiology, ingredient compatibility, compliance with government regulatory levels of pH, and shelf stability. 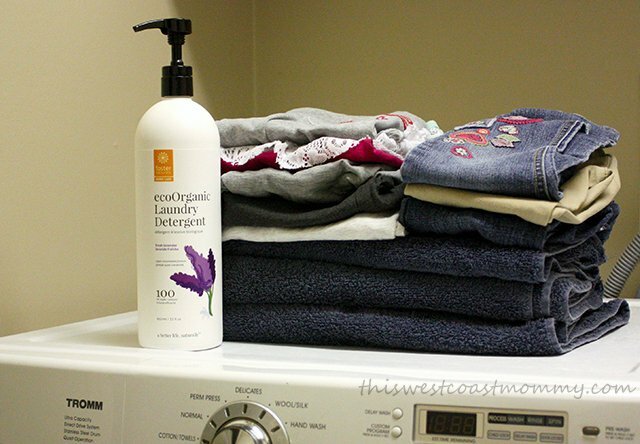 I’ve been using Foster Naturals’ fresh lavender ecoOrganic Laundry Detergent for a few weeks now. It comes in a large pump bottle for easy dispensing and can also be used as a concentrated pre-treater. It works well for my mounds of everyday laundry and leaves everything clean, fresh, and faintly scented like lavender, courtesy of the essential oil – no artificial fragrances to cause allergies or skin sensitivities. I was surprised by how little the recommended amount was (2-5 pumps depending on load and type of washing machine), compared to a capful of my mainstream detergent. Michelle from Foster Naturals explained that because they use absolutely no fillers (which can leave residue and cause discolouration in your fabrics), you just don’t need as much detergent. I didn’t know that those unnecessary fillers and viscous materials in other detergents can get left behind in the drum and contribute to that gross musty smell in my front loading washing machine. Yuck. EcoOrganic laundry detergent is 100% biodegradable, safe for waterways and septic tanks, and hypoallergenic so it’s safe for baby clothes and for your cloth diapers. But how effective is it at cleaning those cloth diapers? We’ve been out of diapers for a few months now so I wasn’t able to test this detergent’s performance on them for myself, but Michelle assured me that prior testing has proven that the powerful antimicrobial cleansers found in the key ingredient, soapwort, are up to the dirty job. Next up is Foster Naturals’ Lemon-Lime Clean Organic Dish Soap which can be used both for hand washing dishes and in your dishwasher, though I mainly use it for soaking and hand washing. Unfortunately, I found it missed some spots on my crusty baking dishes in the dishwasher, but where it really shines is how it performs in the sink. This dish soap makes tons of bubbles, even at the small amounts you use, and it easily cuts through grease (congealed bacon fat even) leaving my dishes squeaky clean. 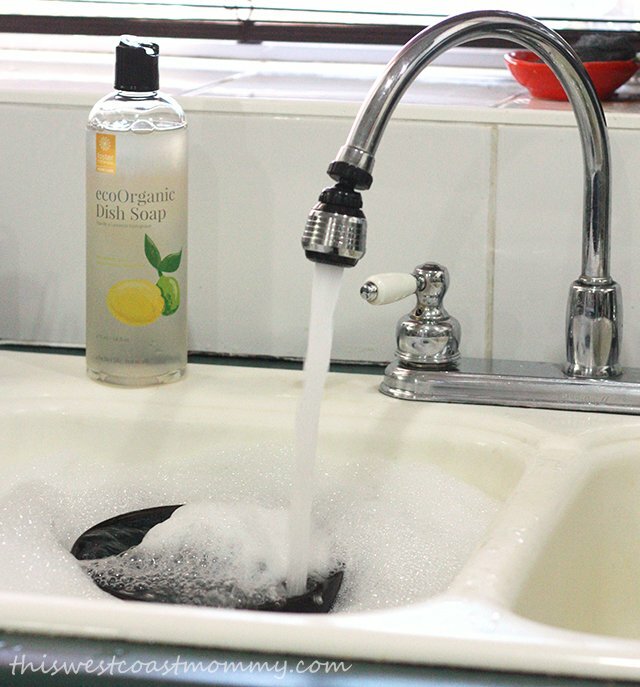 With my regular dish soap, I often had to drain the water and run a fresh sink of bubbles halfway through. But this dish soap’s cleaning power lasts through my entire load of dirty dishes and keeps the grease from redepositing on dishes sitting in the water. Saving time, money, and water is definitely a win! Foster Naturals’ dish soap is safe for my entire family and my local waterways, so it can also be used on cars, pets, and floors too. I really love that I don’t have to worry about Kallie’s dog paws picking anything up on my floors that she shouldn’t be ingesting. 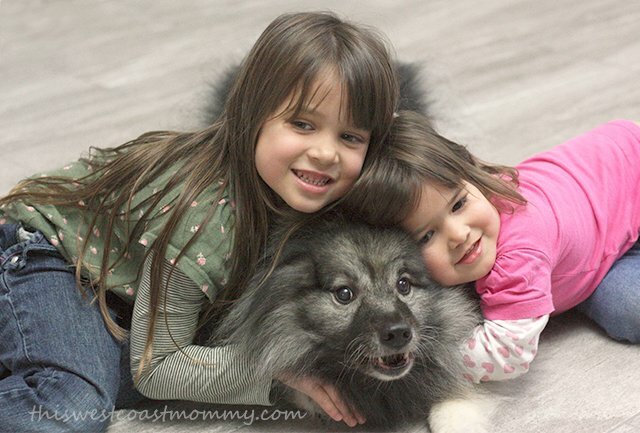 Because she’s part of the family too! Non-toxic, eco-friendly Orange Boost ecoOrganic Surface Cleaner cleans and sanitizes hard surfaces in your kitchen, bathrooms, and around the house with the fresh scent of oranges. I try not to let my bathroom get too dirty, but so far the surface cleaner has done a great job of getting the sinks, counters, and toilets,and chrome fixtures clean. I’ve also gotten good results on my glass stove top. This cleaner comes highly concentrated (10 times) so it’s surprisingly economical. You just mix up your own solution at home in the included spray bottle (with the measurements printed right on the side to save me time) and save on the packaging too. Speaking of which, all the bottles that Foster Naturals uses are recyclable. Either PETE #1 or HDPE #2 plastic, neither of which are known to leach suspected cancer-causing or hormone-disrupting chemicals. We also tried Foster Naturals’ Sweet Orange Organic Shampoo and Organic Conditioner, made from only natural, pure ingredients and sweet orange essential oil. (They’re available in in Field Lavender and Unscented as well.) Both are free of sulfates, parabens, phthalates, phosphate, ammonia, synthetic fragrances, GMO, 1,4 dioxane, and gluten. 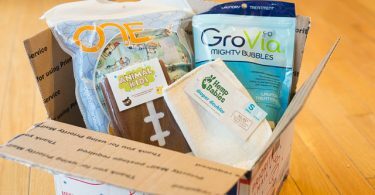 I feel comfortable using these products on my kids, and I would absolutely consider them safe for babies too. I like double duty products, so I’ve been using the shampoo as a body wash for my kids’ bath as well. 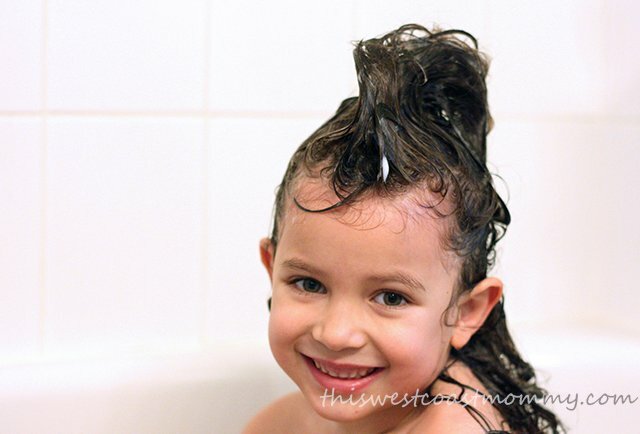 It works great for making funny hairstyles in the tub too! 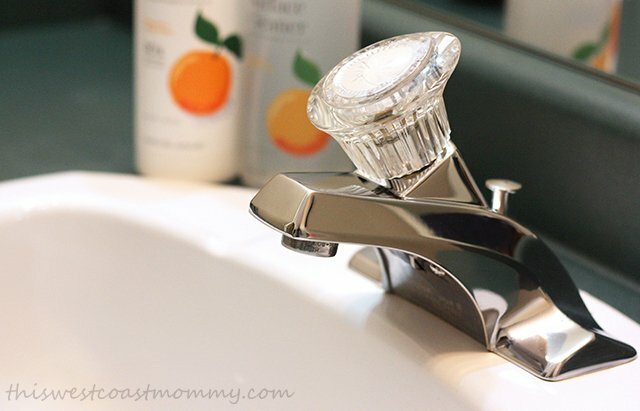 I love the invigorating sweet orange aromatherapy while bathing, but I also like that when their hair dries, it has very little residual scent. That tells me everything rinses out and leaves our hair simply clean. My five-year-old and I both have really long hair so until we decide to go for dreadlocks, we need conditioner. Tee’s especially is quite fine and tangles easily. I noticed this conditioner doesn’t give wet hair the same kind of slippery feel that mainstream conditioners do as it doesn’t contain the silicones you usually find in those products. But once dry, our hair feels soft and smooth and I don’t notice any difference in the results. With all these options available to go greener this year, what changes would you like to make in your home? Shop eco-friendly, made in Canada products for your home at Foster Naturals. Stay connected on Facebook, Twitter, Pinterest, or Instagram. Win a Full Eco-Cleaning Package! 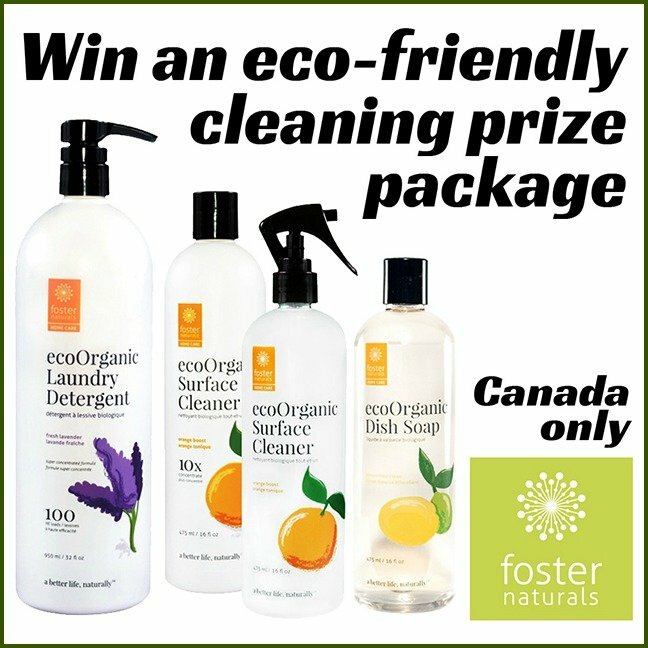 One lucky Canadian reader will win an eco-cleaning package worth $62.00 from Foster Naturals. That’s the laundry detergent, surface cleaner concentrate with refillable spray bottle, and dish soap. Enter in the giveaway widget below. This giveaway is open to residents of Canada, 18+. All entries will be verified. I learner they are non-toxic, organic and natural products and I would love to try the ecoOrganic Laundry Detergent. I am thinking of trying their shampoos .. my daughter and I get allergic reactions to commercial shampoo . So I am hoping these will help . The starter packs look great ! I like that these products are Fair Trade as well as being eco-friendly and gentle on sensitive skin. I learned that these products are non-toxic, organic, natural and Fair Trade products . The ingredients are sustainably sourced, organic, fair-trade, eco-friendly, vegan & cruelty-free. 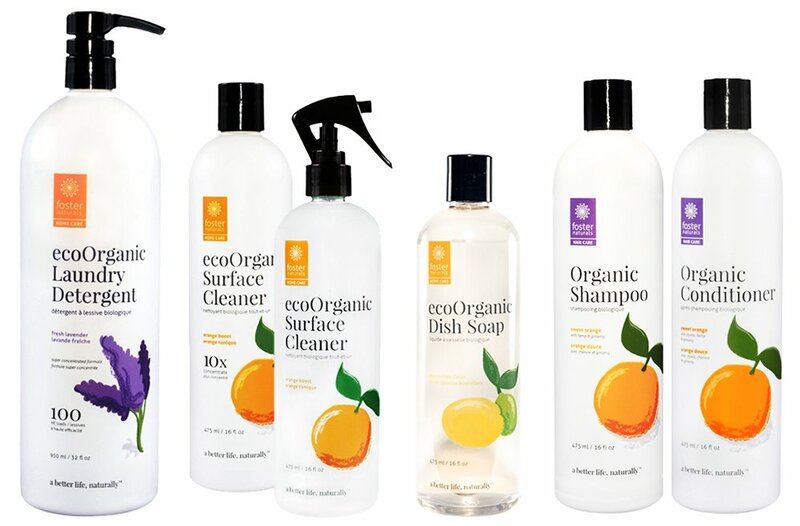 I would like to try the ecoorganic dish soap. I really like their philosophy and there WHY they do what they do – very much in line with my own. I love their web site– very professional and informative. I learned that they don’t have any of the dirty dozen ingredients in any of their products. I haven’t heard of this company before but I’ll be looking for them to try out. I learned some scary things about products I have in my home! Yikes! I would especially be interested in their shampoo/conditioner. I have had some issues with other products and would like to try clean for a change. I learned that there are no toxins in their products. This makes me want to use it with my whole family. I learned that their products are 100% biodegradable. I learned that Foster Naturals use only natural extracts, essences and oils of fruits, vegetables, herbs, nuts, seeds and plants that are sourced ethically and responsibly. I would love to try the organic detergent! It looks amazing, as we are always trying to find new and natural cleaners, these Foster Natural products totally look incredible. No toxic stuff? SIGN ME UP!! I love that this company has such a positive philosophy! I learned that Foster Naturals uses sustainably sourced, organic, fair-trade, eco-friendly, vegan & cruelty-free ingredients. I learned that there will be Foster Naturals products for Men available soon. I like that the products are fair trade. I learned that they have avocado oils in their shampoo and it can really help dry hair. I love the fact that these products are 100 % biodegradable. I learned that the products are waterway and septic system safe. These all sound very nice and I particularly like the body lotion with the shea butter. Shea butter is very moisturizing for the skin and I’d love trying all these products. I like the fresh, clean look of the packaging also. I learned that just because something is labelled “green” does not mean it is without toxins and chemicals. I would like to try the organic detergent! I learned that they use only natural extracts, essences and oils of fruits, vegetables, herbs, nuts, seeds and plants that are sourced ethically and responsibly. No toxins, ammonia, GMOs, sulfates, parabens, phosphate, or other synthetic ingredients. We’re always looking for natural products and I learned that Foster Natural products are sustainably sourced, organic, fair-trade, eco-friendly, vegan, & contain cruelty-free ingredients. They definitely check off all of our requirement boxes! I learned that Foster Naturals is quite local to me. I do like supporting Canadian companies and especially those local to me. I learner they are non-toxic, organic and natural products. IU would love to try the detergent so I don’t have to worry about anything harmful against my family’s skin. I would love to try the Organic Body Lotion with Frankincense, sounds wonderful!! there is no testing of products on animals… nice! I was excited to learn they include both home cleaning supplies and personal care products. I am more and more aware of ingredients I want to avoid, but at the same time, find it overwhelming. Having everything in one place is convenient! I learned that the company is Canadian (yay!) and that the products are non-toxic, natural and organic. I’ve been trying to change over to a more organic lifestyle so I would love to give these products a try! I would love to try their shampoo and I learned that they have a line of pet products coming out soon which is really awesome ! I learned that a lot of products that are labeled “natural” still have many artificial ingredients, which is annoying!! I have allergies and sensitive skin, it would be nice to be able to trust the labels.